As an unwilling victim, Brooklyn Nets interim head coach P.J. 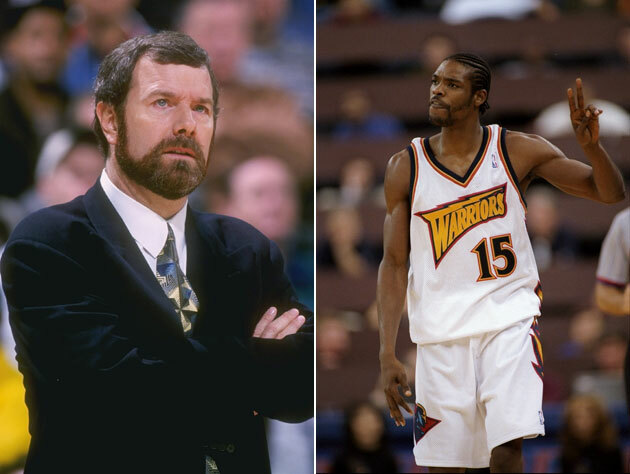 Carlesimo doesn’t want to be known mostly for his Dec. 1997 incident with Latrell Sprewell, but P.J. has always been forthcoming about Spre’s attack on the then-Golden State Warriors coach, and the subject continues to fascinate. Continues to fascinate some 15 years later, even, and you’d have a hard time convincing the 17-year old Kelly Dwyer that had to write about the incident for OnHoops.com that the 32-year old married father of two would still be churning out copy online about the low point for both attacker and victim so many years later. Sprewell, who walked away from the game after regretfully declining a contract with the Minnesota Timberwolves in 2005, rarely gives interviews about the altercation, and we don’t blame the guy. It was a figurative black eye in the midst of an impressive career that saw the All-Star consistently come through with a determined, inspired brand of basketball for three different NBA teams. But even if Latrell isn’t on the record, it’s on his record. More surprise, not shock. Again, I mean, there were so many people around. It was, you know, it’s a practice, and things happen at practice, but no, there was nothing that led up to it. So it was more surprise. (On of if he ever felt in danger) No. It wasn’t a situation like that. No, to this day, I don’t (know what precipitated it), I’m not sure exactly what it was, but…something set him off, and, just, that’s the way he reacted, and the rest is history. I think people who don’t know basketball, that’s the only thing they know. Like if someone says Spre’s name or someone says my name…they say, "Oh, that, those two guys, I know that." From here (New York area), if you say my name, they’ll probably relate it to Seton Hall. If you say it on the West Coast, people relate it to Golden State or to Portland. Did the incident have any racial undertones? No, no, no. People are always gonna, you know, look at it and say, "Well, it’s a black player, it’s a white coach." No. I don’t think so. A lot of the players and coaches in the league (NBA), (who) immediately, you know, stood up and said, "Whoa, wait a minute." Let’s not bring something into this that’s not in it." That never had any legs. Did he and Sprewell patch things up? P.J. prefaces the chat by pointing out that he and Sprewell did not have a “great” relationship prior to the confrontation, but that they didn’t have a bad one. Sort of par for the course for players and coaches that are only in their second month of working together. This isn’t where we try to excuse what Sprewell did, violence is never the answer for anything (unless we’re talking about me, I’m at a bar, and you said something inappropriate to my wife), and Latrell’s actions were completely unprovoked. What is often underreported in the years since the incident, though, is what was going through Sprewell’s mind when he decided to unleash two inexcusable attacks on his coach. The Golden State Warriors were working through a practice after a 1-13 start to the season. The team had not made the playoffs since the 1993-94 campaign and would not make the playoffs again until 2006-07. The lottery prizes for the previous two seasons included Todd Fuller (selected in front of Kobe Bryant, Steve Nash, and Jermaine O’Neal) and Adonal Foyle (selected in front of Tracy McGrady). Each of the members of the team Sprewell had made the playoffs with in 1994 – Chris Webber, Chris Mullin, Tim Hardaway included – had been traded away for precious little to show, save for a player in Donyell Marshall that had yet to find his NBA groove. On top of that, respected coach Rick Adelman had been let go from the Warriors the previous offseason because the team’s front office somehow thought he could make a playoff team out of this roster, and failed. Adelman was tossed and Carlesimo (following an up and down stint with the playoff-makin’ Trail Blazers) moved down to the Bay Area. Portland guard (and good friend of Sprewell’s) Isaiah Rider had reportedly warned Spre about Carlesimo’s combative nature, and this is one of the reasons that you shouldn’t rank Isaiah Rider as one of your good friends. So it was Carlesimo, and not Sprewell, that came into training camp in the fall of 1997 with a reputation. By early December, Sprewell was banging his head against the wall as a member of a 1-13 team, a group that had only topped 100 point twice in 14 tries, with one of those games needing overtime. He was the best player on a very, very bad team – one that actually improved significantly late in the season with the addition of Jason Caffey. That’s right, Jason Caffey. And in yet another practice for yet another terrible team , stuck working a passing drill with Muggsy Bogues (not to belittle Muggsy Bogues, but … Muggsy Bogues), Latrell Sprewell lost it when P.J. Carlesimo asked him to put some mustard on those passes instead of rolling his eyes through practice. I’m not making excuses for Sprewell. I’m just pointing out what it was probably like to be Latrell Sprewell in December of 1997. Sprewell attacked P.J. Carlesimo, there’s no way around it. And then a cooling out period led to more anger and more frustration and Sprewell returned to practice to attack his coach again. Wrong in every conceivable sense. Carlesimo, in the interview with YES, points out that Sprewell hasn’t directly apologized to his former coach despite a few “cordial” discussions between the two, but that P.J. has no problem with that. Mostly because he probably doesn’t want to care about Latrell Sprewell anymore. But also probably because he understands the misery and frustration of staring down four and a half more months of lottery level basketball in early December, with 68 more games to play in a long season. One thing is certain. If both agree, in 15 years’ time, this will make for a fascinating dual interview and/or documentary. I’m not entirely convinced either will be keen to discuss their respective low points, though.